Margaret Gaskin-Tuell, ’18, began her journey of becoming an artist as a young girl the day her father built her an easel. She went on to graduate high school, enter the workforce, build a family with her husband, and travel the world. But throughout that time, Margaret never stopped painting, and she never gave up on her dream of earning her degree in her craft – a dream that ultimately led her to Meredith College. Despite many attempts to continue her education, Margaret, who was always traveling, never stayed in one place long enough to complete her degree. She retired in 1997 and eventually moved to North Carolina. She enrolled in a graphic design program in Durham, but did not feel that graphic design challenged her in the way she needed. After being referred to Meredith by an alumna, Margaret met with Beth Mulvaney, professor of art and her current adviser. She fell in love with the campus community and transferred in 2015, 18 years after retirement. At Meredith, Margaret has gotten involved on campus, serving in the WINGS Adult Student Organization, Kappa Pi, and the Artists Alliance. She was also on the Dean’s List, and was presented with the Wings Adult Student Organization Outstanding Member Award in 2016 and 2017. Her close connections with students and faculty were a source of encouragement and support for Margaret. Her involvement with different organizations gave her the opportunity to tackle challenges by working together with different generations. Her participation in the Meredith community has also encouraged Margaret to become involved in her local community. She visits retirement homes with her therapy dog in an attempt to bring joy to people who are not able to have pets of their own. 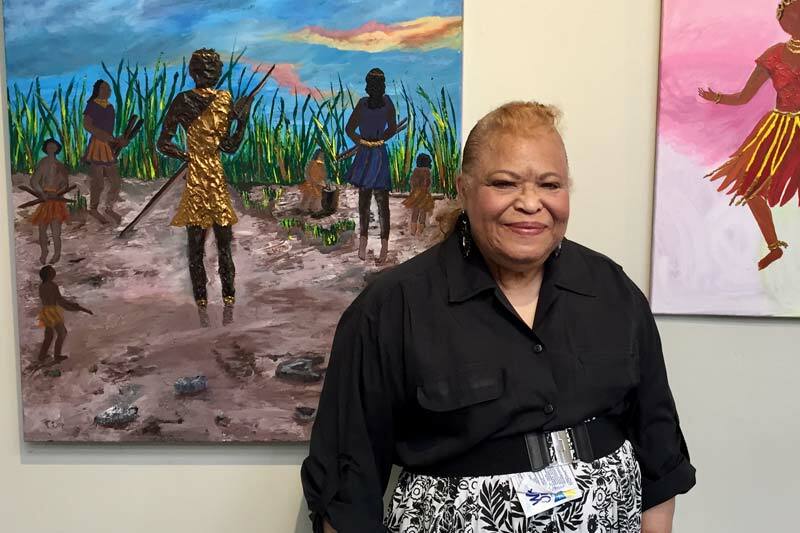 Returning to school posed a challenge for Margaret, who had to learn to sharpen her time management skills in order to be successful in different courses and to paint as necessary. She credits the faculty at Meredith for much of her academic success. Margaret's memories, including those she made at Meredith, inspired the theme of her senior art exhibition, “African Celebration and Rituals.” The paintings featured were largely influenced by the stories she read in her African American Literature course and what she learned about fading African traditions and rituals. Margaret’s exhibition also included art inspired by her family, including a tribute to her mother’s love for music. As her time as a Meredith undergrad comes to an end, the lifelong artist will continue to paint as she always has. But she has no intention of leaving the belonging she found at Meredith. Margaret plans to be a non-degree seeking student and audit courses while continuing to inspire Meredith Angels to follow through on their dreams – wherever and whenever they may take them.